Bhagwan Mahaveer Sanctuary and Mollen National Park is situated in Sanguem taluk, Goa and is spread over an area of 240 square kilometers. The park shares its eastern border with Karnataka state. Bhagwan Mahaveer Sanctuary and Mollen National Park is divded into two parts as National Highway Number 4A passes through the park. Mormugao – Londa railway line passes through the park area. Dudhsagar Falls, 4 tiered cascading waterfalls, is inside this park. Many temples built during the Kadamba Dynasty are seen inside Bhagwan Mahaveer Sanctuary. Originally known as Mollem Game Sanctuary, it was declared as a wildlife sanctuary in 1969. Later on, in 1978, a portion of the wildlife sanctuary was declared as Mollem National Park and name was changed to Bhagwan Mahaveer Sanctuary and Mollen National Park. The sanctuary has several perennial water sources. Goa depends on the Mahadayi river for 60 % its water needs. which originates in the border areas of Karnataka and Goa. Tambdi Waterfall is a beautiful fall slightly shorter than the magnificent Dudhsagar Falls is also inside the sanctuary. Tambdi falls is difficult to access as it requires climbing steep rocky path. Bhagwan Mahaveer Sanctuary is very rich in flora and fauna with 722 species of flowering plants. 128 species of endemic plants, endemic to either Western Ghats or to India are seen in this sanctuary. An additional 37 species of Pteridophytes (plants which neither flowers nor have seeds; but reproduce and disperse via spores) are also found in this National Park. Many Mammals, Butterflies, birds and Reptiles are also seen in this park and is home to pristine vegetation like West Coast tropical evergreen and semi-evergreen forests and moist deciduous forests. Dhangar, a tribal community of nomadic buffalo herders (mainly seen in Maharastra and Goa), lives in this park. How Do I Go to Bhagwan Mahaveer Sanctuary and Mollen National Park? Molem is the nearest town to Bhagwan Mahaveer Sanctuary and Mollen National Park at around 57 kilometers distance from Panaji, capital of Goa state, India. Palamau Tiger Reserve is the lone tiger reserve (where Tigers are spotted recently) in the state of Jharkhand. It is one among the nine original tiger reserves in India. This Tiger reserve is part of Palamau Wildlife Sanctuary. This Tiger Park is spread over an area of 1,129.93 square kilometers (436 sq miles) in Latehar and Garhwa Districts. It was declared as a Tiger reserve in 1974. Core area of the Tiger reserve is spread over 414.93 square kilo meters. The buffer area is spread over an area of around 650 square kilometers. Palamau Tiger Reserve is part of the Famous Betla National Park. It is also a Project Tiger reserve for conservation of Bengali tigers. Apart from Tigers, this Tiger Reserve has Elephants, Leopards, Sambars, Gaurs and Wild Dogs, to name few of the other wild animals. One male Tiger and five female Tigers are there in the Tiger Reserve, as per the 2012 counting (undertaken using DNA to prevent over-counting). As per the 1974 count, there were 50 Tigers in this Tiger Reserve. As per 2007 count, there were 17 Tigers. As per Forest department, the core area of the Tiger reserve is inaccessible due to difficult terrain and Naxalite presence. Hence, an accurate count of Tigers is not possible. North Koel River, a sub-tributary of Ganga River, runs through the Palamau Tiger Reserve. Over 140 species of birds are sighted in Palamau reserve forests. Two white vultures were spotted in the Tiger reserve at Palamau in 2013, after a gap of nearly 10 years. How Do I Go to Palamau Tiger Reserve? Palamau Reserve for Begali Tigers can be reached by taking National Highway 39. It takes around one and a half hours drive, to travel from Latehar to the tiger reserve, to cover 65 kilometers distance by road. Mount Abu or mt Abu is Rajesthan’s Lone Hill Station is in Sirohi District, on the state border with Gujarat state, in India. Mt Abu is a 22 kilometer by 9 kilometer rocky plateau (length and breadth). The highest peak is at around 5,650 ft (or 1722 meters) above sea level. Mt Abu is believed to be the original abode of Gurjars, a pastoral ethnic group of India, Pakistan and Afghanistan. There are rivers, waterfalls, lakes and forests in this Mount. The Mount Abu Wildlife Sanctuary, with an area of 290 square kilometers, was created in the year 1960. Adhar Devi Temple, which is carved out of solid rock, is a major tourist attraction here. There are many other Hindu and Jain temples in Mount Abu. Dilwara temple is one among them, made of white marble, constructed in between the 11th and 13th centuries A.D. The Achalgarh fort of 14th century A.D. in Nakki Lake (a very ancient sacred Lake for Hindus) is another major tourist destination in this Mount. There is the Rock on a hill near the Nakki lake, which looks like a Toad and hence called “Toad Rock” (can be seen in the above picture), which is about to jump into the lake. India’s ‘Father of Nation’, Mahatma Gandi’s ashes were immersed here in the Nakki Lake. There is a memorial for Mahatma Gandhi, called “Gandhi Ghat “. A little away from Mount Abu lies the Durga temple and Ambika Mata Temple, in a cleft of rock in Jagat. How Do I Go to Mount Abu, Rajasthan’s Lone Hill Station? Mount Abu railway station is the nearest rail-head at around 26 kilometers from the hill station. Maharana Pratap Udaipur Airport at Udaipur is at around 200 kilometers distance to Mt Abu. Ahmedabad is at 220 kilometers distance, Jodhpur at 270 kilometers and Jaipur is at 500 kilometers away from Mt Abu, Rajasthan’s Lone Hill Station. Can you Name a Few Mount Abu Hotels? Hotel Hillock and Hotel Karnavati are 4 star Mount Abu hotels. The Colonial Hotels, Hotel Chanakya, Hotel Hilltone, Chacha Inn & Hotel Banjara are 3 star Mt Abu hotels. Hotel Maganji’s, Hotel Aradhana by Ashoka & Palanpur Palace Hotel are 2 star Mount Abu hotels. Tal Chhapar Wildlife Sanctuary is in Churu district of Rajasthan State in India at a distance of around 210 kilometers from Jaipur, the capital city of Rajasthan state, on the Ratangarh – Sujangarh Highway. If you are thinking of visiting Rajasthan, a trip to Chhapar is worth considering to know more about India and its Dessert Wildlife and migratory birds. 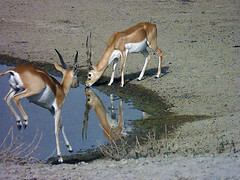 You can find a large number of Black Buck in Tal Chhapar Wildlife Park. Tal Chhapar Sanctuary is on the border area of the Great Indian Desert. Tal means plain areas. Chhapar is the village name which is part of the sanctuary. Tal Chhapar Wildlife Sanctuary is made up of open grasslands with Prosopis and Acacia trees, making the park a tropical forest. There are very few trees in the park. Many migratory birds pass through this park in September. Harriers is the major migratory bird among them which flies in distinct groups of male, female and immature. ‘Mothiya’, with sweet seeds, is a type of grass seen in this part of the park. Mothiya is the food for black bucks and migratory birds. Local people also eat this seed. 85 kilometers from the district headquarters of Churu, lies the Tal Chhapar Wildlife Park, on the Nokha to Sujangarh state Highway. Bikaner in Rajasthan is at 132 kilometers distance from the Wildlife Park . ‘Chappar’ is the nearest railway station on the Degana – Churu – Rewari railway line. It is a meter gauge railway line. ‘Sekhawat’ railway station on the broad gauge railway line also serves as a link to Chhapar Park (Tourist Train ‘Palace on wheels‘ stops here). Pink city of Jaipur has the nearest airport to Tal Chhapar Wild life Park. India’s capital city of New Delhi is at around 350 kilometers from the Chhapar Park.